John and the workshop team have been working hard on some newly devised, handcrafted, metal window box designs – strong, long-lasting and very stylish – a cut above the usual. In this blog, we explore the possibilities of the different designs and their suitability for both heritage and modern properties. Since Roman times and no doubt long before, small planting structures have been added to windows and walls. Historic ‘window boxes’, originally terra cotta or wood and sometimes built in to the house design, would have been handy, accessible containers for mini culinary and medicinal herb gardens. There’s also evidence that more decorative flower displays were also planted, way back, a practice still very visible across Italy and the Mediterranean. Garden Requisites’ three new window box designs and crafting methods reference ironwork and metalwork designs from more recent history with a nod to Georgian and Victorian workmanship as well as coming right up to date to include a more contemporary, pared back look. There are no real rules as to which window box design can be paired with which architecture but, in addition to our first English wirework window boxes, John’s new designs are created with certain architectural applications in mind. 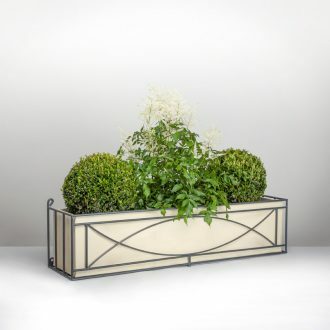 The Ironwork Window Box range has an attractive cross pattern and an air of Art Deco that will work well in either period or contemporary environments whereas the Royal Crescent-inspired, curved lines in the Crescent Window Boxes can suit a more traditional, Georgian period property. For some heritage planting inspiration do take a look at our Georgian Gardens pinterest board. All our new window boxes can come in a variety of off-the-shelf or bespoke or bespoke sizes with optional coloured liners and are sturdy enough to hold portable pots and planters. 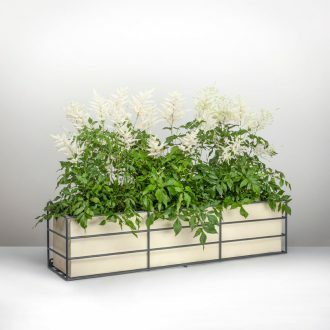 As well as the Ironwork Window Box range mentioned above, for straighter lines, the rectilinear, sleek simplicity of the new Contemporary Window Box could prove more fitting for minimalist, modern surroundings. This is also a neat style for interior wall boxes, an uplifting and currently very fashionable way of bringing the garden into the house or office. Post Chelsea Flower Show, no doubt heads are swimming with freshly coveted flowers and foliage to plant up. We’ve also plenty of wonderful window box planting combination ideas in the wings – from smart topiary through to blousy wild flowers. Window boxes really do bring a building to life and when repeated on multiple house frontages along a street can brighten whole neighbourhoods. However simple, a new design at Garden Requisites takes months of careful consideration – in terms of aesthetic look, daily use, performance amongst the elements, practical handling, installation and more. Garden Requisites’ British-made, zinc-galvanised, steel window boxes are such a rewarding investment and might be seen as building fabric improvements as much as decorative display. They may also replace ancient fixtures so freshly forged, sympathetic craftsmanship can be in place for many, many years to come. We do hope you’ll find inspiration in our new metal window box ideas. If you need any advice on finishes, colours, installation or bespoke sizing for awkward spots, just give us a call or send through an email. In the meantime, we’ll be catching up on the bits we missed at Chelsea. Always trawling for new planting ideas!